The following is an online version of the leaflet, jointly produced by the UK Renal Registry (UKRR) and the NKF (National Kidney Federation). They aim to provide accurate and up to date information for patients and carers about several topics related to dialysis and kidney transplantation which may be of interest. This is a new initiative and they would welcome your comments on this leaflet for future publications. In this first leaflet they aim to provide some background to the UK Renal Registry and a few examples of the type of information that is available to you. What is the purpose of this leaflet? In this leaflet, jointly produced by the UK Renal Registry (UKRR) and the NKF (National Kidney Federation), we aim to provide accurate and up to date information for patients and carers about several topics related to dialysis and kidney transplantation which may be of interest. This is a new initiative and we would welcome your comments on this leaflet for future publications. In this first leaflet we aim to provide some background to the UK Renal Registry and a few examples of the type of information that is available to you. The UKRR collects, analyses and publishes information about the treatment of kidney failure in people on dialysis or with a kidney transplant in the UK, both at national and renal centre level. These treatments are also known as renal replacement therapy (RRT). The UKRR latest report analysing 2012 data is available on the internet at www.renalreg.org and is used by different groups to support improvements in the quality of care. In each of the following sections we have provided a reference to the relevant chapter in the 2013 Annual Report if you would like to see more detail. What is the NKF (National Kidney Federation)? The NKF is a federation of 52 Kidney Patient Associations and is the largest kidney patients’ charity in the UK, run by patients for patients. It provides direct support to patients and others through a dedicated Helpline and a team of Advocacy Officers. The NKF campaigns for improvements in the provision of services for kidney patients with regular contact with the Department of Health, NHS Blood and Transplant (NHSBT), politicians and providers of health services. The NKF publishes a newsletter, Kidney Life, four times a year which is available free of charge. 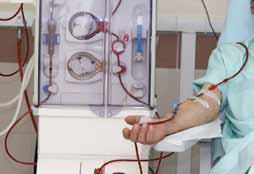 How many people are currently on dialysis or have a kidney transplant? At the end of December 2012 approximately 55,000 adults in the UK were undergoing RRT (either receiving dialysis treatment or with a functioning kidney transplant). 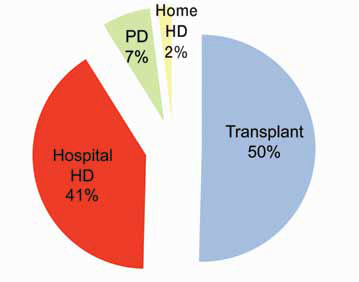 Of these, 27,621 (50%) had a working kidney transplant, 22,331 (41%) were receiving haemodialysis at a hospital, 3,792 (7%) were on peritoneal dialysis and 1,080 (2%) were on haemodialysis at home (see figure 1). The number of patients on home haemodialysis is slowly starting to increase as the hospital kidney centres become more able to provide and support home haemodialysis and kidney patients are choosing to do their own dialysis at home. However there is large variation across the country (see Chapter 2 (table 2.16) of the UKRR Annual Report 2013). The percentage of dialysis patients on home haemodialysis varies greatly from 0% to 13% and patients may wish to discuss this with their doctors at a local level. Overall, the number of people on renal replacement therapy in the UK continues to increase and at present it is increasing by around 2,000 patients per year. Who is affected by end stage kidney disease and renal replacement therapy? Kidney disease is more common as we get older, and although people of all ages do need to start RRT, it most commonly affects people aged between 65 and 84 years (figure 2). For example, for every one million people aged 40-44 in the UK, around 80 people started RRT in 2012. In comparison, for every one million people aged 75-79 in the UK, around 400 people started RRT in 2012. In 2012, more men started RRT than women (62% male versus 38% female). For example, figure 2 shows that in 2012 for the age-group 60-64 years, for every one million women in this age-group, about 150 started RRT, whilst for every one million men in the same age-group, about 250 started RRT. Different ethnic groups have different risk levels of kidney failure needing RRT, with patients from a Black, Asian or Minority Ethnic (BAME) background at most risk. People from a BAME background make up around 15% of the whole population in England. However, around 22% of those who started RRT in Facts and Figures for Kidney Patients England in 2012 were from a BAME background, indicating a higher risk of starting RRT in these ethnic groups compared to White people. We do not yet fully understand why this difference exists and the reasons are complex. In the UK, diabetes is the most common cause of kidney failure. Diabetes is more common in BAME patients and this may be part of the explanation. Are people living longer on RRT? Of all the people who started renal replacement therapy in 2011, 86% were alive twelve months later, a significant improvement from 78% who started RRT in the year 2000 (see Chapter 8 (table 8.10) of the UKRR Annual Report 2013). This improvement has occurred even though more elderly patients and patients with health problems other than kidney failure started treatment in 2011 compared to 2000. However there is still much work to be done to continue to improve the health and wellbeing of people requiring RRT. How many people with kidney failure get a kidney transplant? Data from NHSBT shows that in the last ten years the number of deceased-donor kidney transplants performed each year has increased from around 1,400 to 1,930 (figure 3, see also NHSBT Activity Report). In addition, the number of kidney transplants from a living donor has doubled in the last ten years, and is now around a thousand transplants per year. How many patients are waiting for a kidney transplant? At the end of 2012 more than six thousand people were waiting for a kidney transplant, with more than a quarter of those on the waiting list being from a BAME background. The average age of dialysis patients on the list for a kidney transplant in January 2011 (see Chapter 4 of the UKRR Annual Report 2013) was 53 years, more than ten years younger than the average age for the total dialysis population. Whilst the number of patients waiting for a kidney transplant has slightly decreased in the last few years (figure 3, blue line), many patients are still waiting for a kidney transplant. Number of live and deceased-donor transplants and patients on the active transplant list at 31 March. Once registered on the waiting list, waiting time can differ considerably between patients. On average the waiting time is around three years, with one in five patients getting a kidney within a year and about two out of three receiving a transplant by five years. Patients from a BAME background have to wait longer and their waiting time on average is around four years (see NBTA data report July 2013), partly related to the need to match blood and tissue group between donor and recipient and also to a shortage of donors from these groups. Regrettably, around three patients die every day in the UK in need of an organ transplant (many of whom are kidney patients). Work continues to improve this situation and to increase the number of available donors (for example the seven year strategy “Taking Organ Transplantation to 2020” published by the four UK governments and NHSBT in 2013), but more needs to be done to increase the number of kidney transplants, especially for Black, Asian and minority ethnic groups. We would welcome your feedback and ideas for future topics. Please send your comments and any questions to the NKF Helpline (contact details below). With thanks to the Scottish Renal Registry and NHS Blood and Transplant for their data.